Pink — Constitutions with the mandatory periodic constitutional convention referendum. Purple — Constitutions with the explicit constitutional convention popular initiative. Green — Constitutions with both of the above constitutional convention mechanisms. *States that arguably have the implicit constitutional convention popular initiative can be found here. Short course held at the Annual Meeting of the American Political Science Association, Philadelphia Convention Center, Wednesday, August 31, 2016, 2:00 pm to 6:00 pm. Produced by J.H. Snider. The first part of the course, which included TV documentaries and pro & con political ads, can be found here. A symposium summarizing the short course was published by the Law and Courts Section of the American Political Science Association. See Symposium: The Politics of State Constitutional Reform, Law and Courts Newsletter, Fall 2016. The symposium contributors were J.H. Snider, Sanford Levinson, John Dinan, and Carol Weissert. Background reading, including references to major works in this literature, can be found at J. H. Snider, Does the World Really Belong to the Living? The Decline of the Constitutional Convention in New York and Other US States, 1776–2015, Journal of American Political Thought 6, no. 2 (Spring 2017): 256-293. Snider, J.H., The State Con-Con Papers, Social Science Research Network, October 31, 2018. A compilation of 47 short essays by J.H. 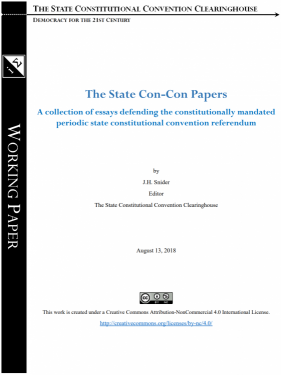 Snider on the history, democratic function, and politics of the periodic state constitutional convention referendum. 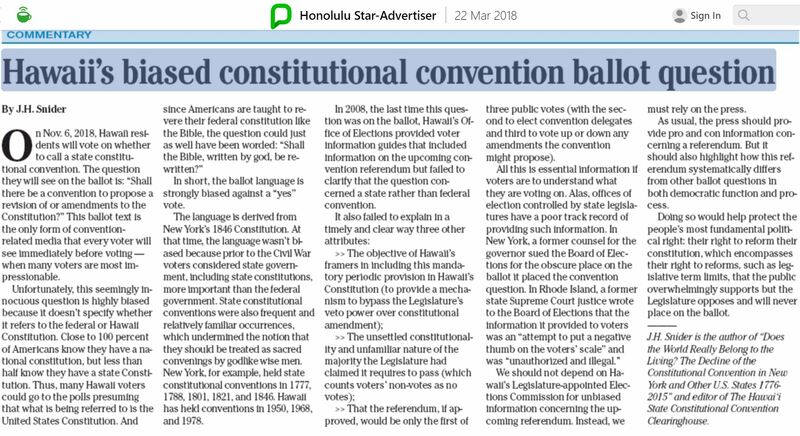 Snider, J.H., Hawaii’s Failed Campaign Finance Law: The Case of the Star-Advertiser’s Missing Front Page Ad Disclaimer, Hawai`i Free Press, January 19, 2019. 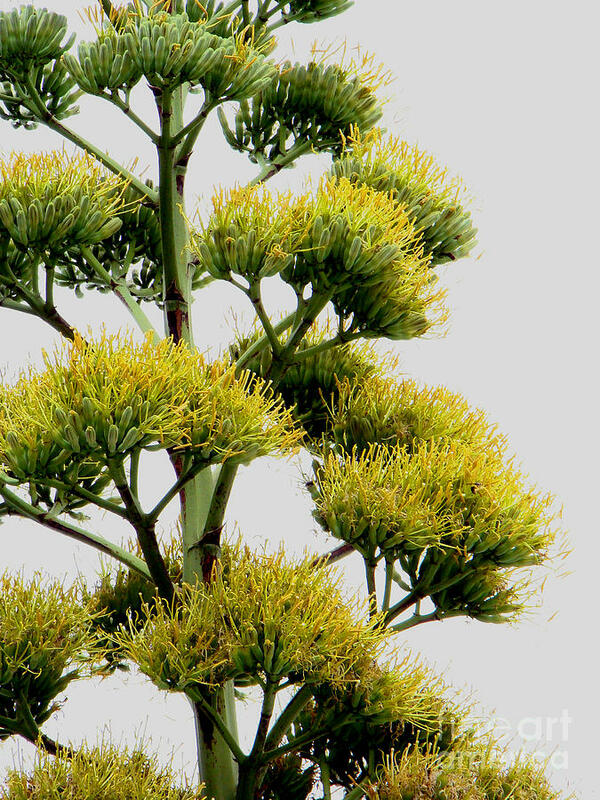 Agave Americana, popularly known as the American Century Plant, is a plant that flowers once every 10 to 30 years in perpetuity via clone daughter plants. Its periodic and beautiful flowering is symbolic of the periodic state constitutional convention referendum. A consequence of the plant’s flowering so infrequently is that people forget it’s a flowering plant by the time it next flowers. 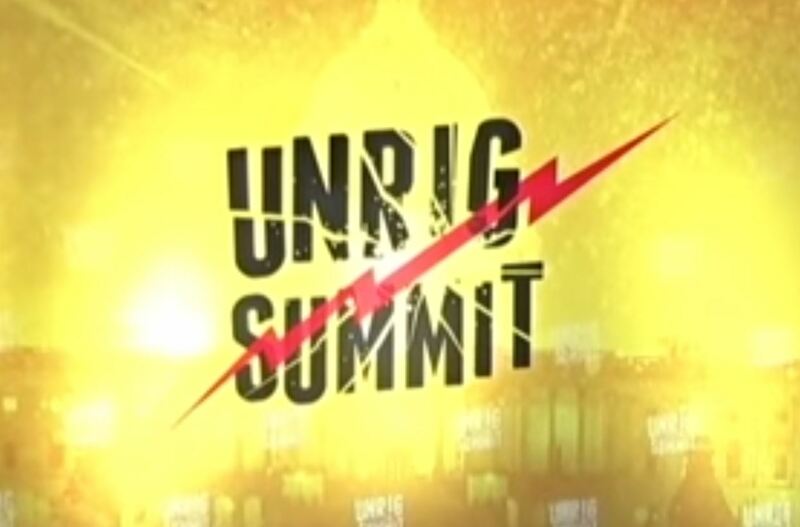 At the “Unrig the System Summit” in Nashville, Tennessee on March 31, 2019, J.H. Snider explains that America has two constitutional mechanisms at the state level to bypass a legislature’s gatekeeping power over constitutional reform: the well known and often utilized popular constitutional initiative, and the little known and relatively rarely used periodic constitutional convention referendum. Click on the video, which will open in a different window. 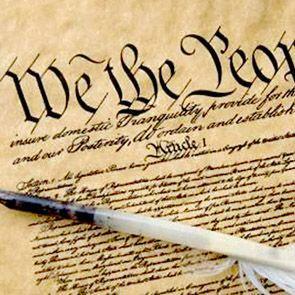 Since the late 18th century, the institution of the state constitutional convention has evolved substantially. For example, it was rare until the 19th century to have a popular election to either convene a state constitutional convention or to ratify its recommendations. Many state constitutional conventions also had legislatively appointed rather than popularly elected delegates. By the 20th century, however, popular elections to convene a state constitutional convention and then ratify its recommendations became the norm, as did popular election of delegates. The periodic state constitutional convention, which is a variant of the state constitutional convention, is a relatively recent institutional innovation. By the end of the 18th century, only one U.S. state had it; by the end of the 19th, seven; and by the end of the 20th century, fourteen. Note that this is only an idealized outline that skips vital procedural details that vary from state to state. The Comparative Features and State Rankings web pages of this website focus on clarifying the significance of some of that procedural variation. A government agent (such as the legislature or secretary of state) places the periodic referendum on the ballot. Voters vote on the referendum. A government agent determines whether the referendum has been approved. If the answer is yes, a government agent arranges for the election of delegates to and the subsequent convening of the convention. Candidates register to run for delegate. Delegates meet as a public body (the “constitutional convention”), deliberate on proposed constitutional amendments, and then vote on which ones to place on the ballot for voter ratification. Voters vote on whether to ratify the proposed amendments. 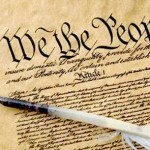 A state constitutional convention does not have unlimited power. It is subject to major checks, the most notable of which are approval of everything it proposes by the voters and compatibility with the U.S. Constitution of any proposals the voters approve. The various major checks are listed below, with the checks by other branches of government, excluding the state legislature, highlighted in red. 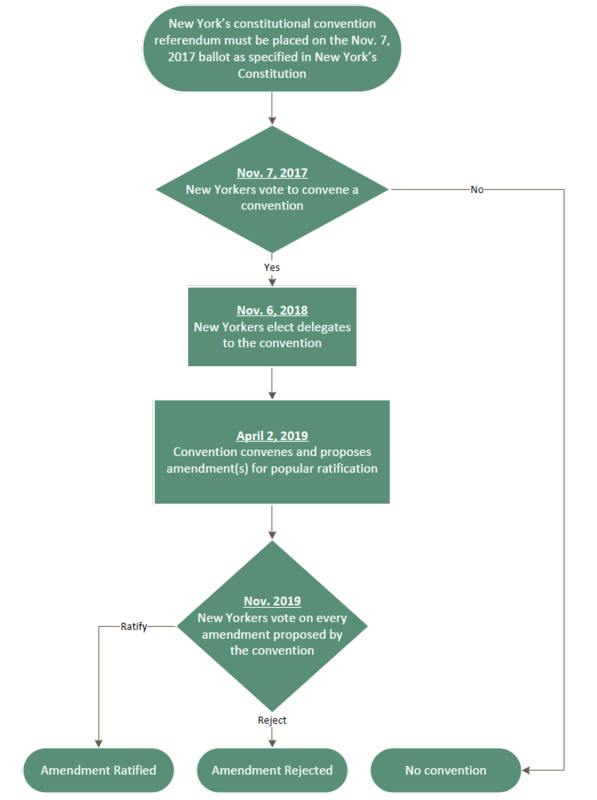 Voters vote on a referendum on whether to convene a state constitutional convention. 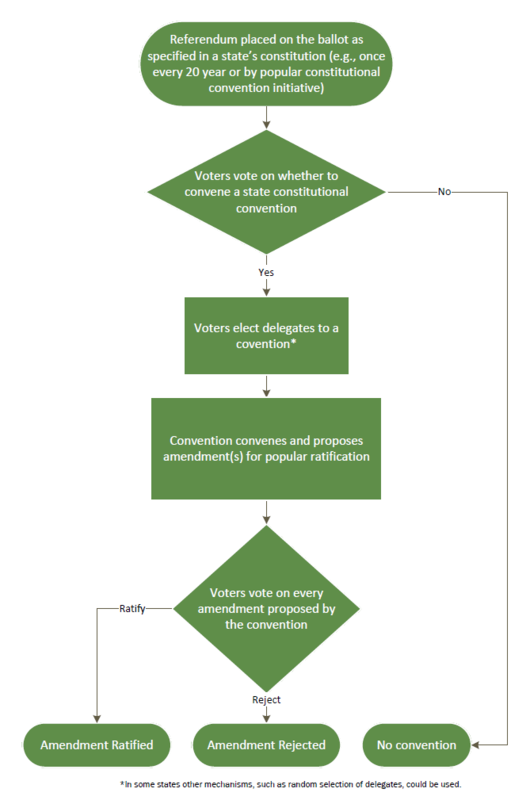 Voters vote for delegates to the state constitutional convention via competitive elections. 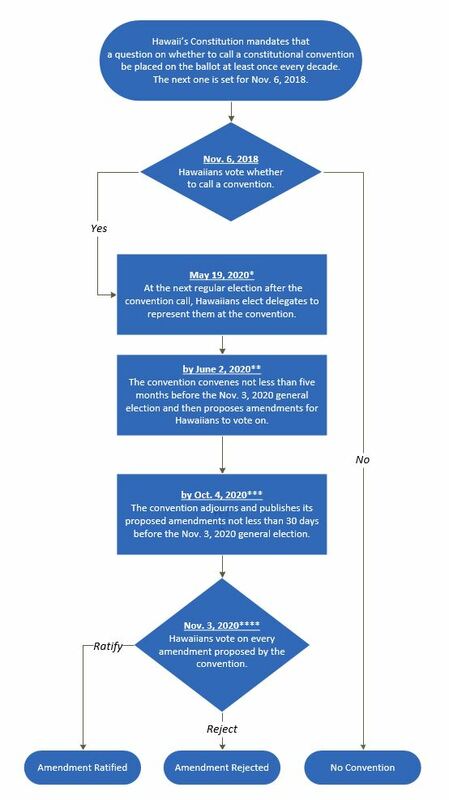 The elected delegates meet as a public body (the “constitutional convention”), which deliberates and votes in public on proposed constitutional amendments and then only places on the ballot for voter approval those proposals that receive a majority vote of the delegates. After the adjournment of the constitutional convention, the proposed amendments are published for the public to deliberate upon for an extended period of time before being asked to vote on them. The ratified laws must be consistent with U.S. government law, including the U.S. Constitution, U.S. Supreme Court case law, Congressional statutes, and federal rulemakings, all of which may be changed at any time. * This assumes that the proposals the voters ratified didn’t restrict legislatively initiated constitutional revision or judicial review. The amount of legislative control over the periodic state constitutional convention process is one of the key areas where state constitutions vary. 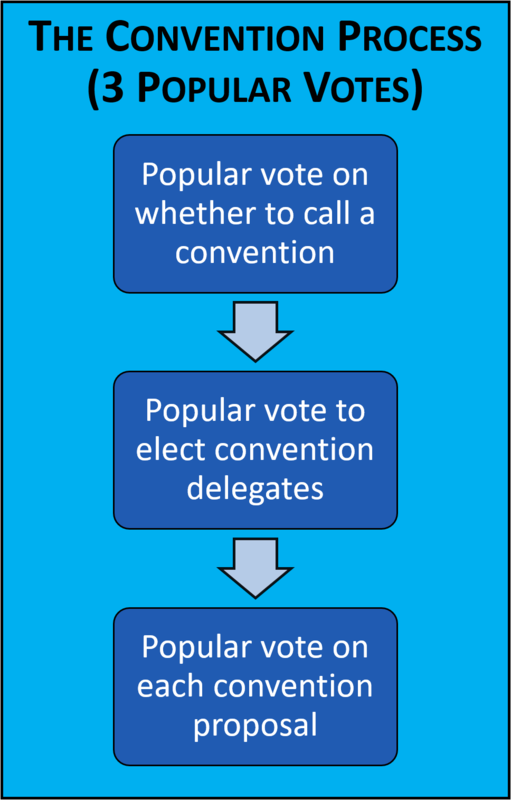 For example, some states allow legislators to run as delegates; others ban it. The following lists some of the shared constitutional limitations on legislatures as of the early 21st century. In practice, these limitations aren’t absolute, as legislatures have sometimes found politically feasible ways to circumvent them. The key feature, which explains the universal hostility of legislatures to the periodic state constitutional convention, is the absence of legislature agenda control and is marked in red. The legislature cannot prevent the people from having an opportunity to vote on whether to convene a state constitutional convention. The legislature must allow the people to convene a state constitutional convention if the requisite majority of people votes in favor of one. The legislature cannot directly gerrymander the districts from which the state constitutional convention delegates are elected. The legislature cannot control the state constitutional convention’s internal procedures. The legislature cannot limit the state constitutional convention’s agenda.